Recognizing the importance of making biodiversity data openly available to all countries and individuals underscored by various international agreements, the OECD Committee for Scientific and Technological Policy in 1999 endorsed the recommendation to establish a Global Biodiversity Information Facility (hereinafter referred to as “GBIF”) with open-ended participation. 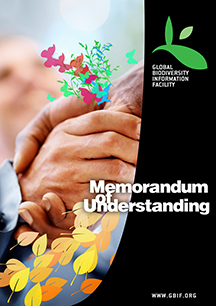 NOTE: The English version of the MOU is the official one and the only one available for signature by those countries or international organizations that wish to be members of GBIF. Members of the GBIF community have contributed unofficial translations solely for the purpose of guidance.